En route and Washington, DC. Saturday, February 4, 1865.En route and Washington, DC. At 7:30 A.M. President leaves Annapolis, Md., following overnight trip up Chesapeake Bay from Hampton Roads, Va., on "River Queen." Arrives in Washington at 9:25 A.M. Evening Star (Washington, DC), 4 February 1865, 2d ed., 2:1; Washington Chronicle, 6 February 1865. Orders Lt. John A. Stephens (CSA), nephew of Alexander H. Stephens and prisoner of war on Johnson's Island to report in person to White House. Abraham Lincoln to Charles W. Hill, 4 February 1865, CW, 8:259. Transmits to Senate information on condition of Mexico and case of French steamer "Rhine." Abraham Lincoln to the Senate, 4 February 1865, CW, 8:259-60. Cabinet meets in special session from noon until 1 P.M. to hear reports of President and Secretary of State Seward on Hampton Roads Conference. Evening Star (Washington, DC), 4 February 1865, 2d ed., 2:4; Welles, Diary. President confers with Secretary of War Stanton on effect of conference on Gen. Grant's military plans and authorizes Stanton to telegraph Grant "that nothing transpired, or transpiring with the three gentlemen from Richmond, is to cause any change hinderance or delay, of your military plans or operations." Stanton to Grant, 4 February 1865, Abraham Lincoln Papers, Library of Congress, Washington, DC. 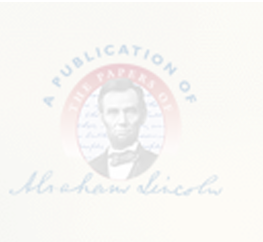 Mrs. Lincoln holds afternoon reception from 1 to 3 P.M., and President attends. Evening Star (Washington, DC), 4 February 1865, 2d ed., 2:4; Washington Chronicle, 5 February 1865.